Saturday was hot and humid and in the mid 90's. Sunday brought on some rains and the temperature cooled. This is our summer fading into fall here in Colorado. This is also the best time of year to harvest all the bounty from the garden that we have been tending for over the past 6 months. I will admit my favorite part of gardening is picking the fruits and veggies. 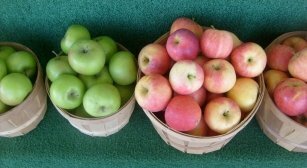 I love to make fresh recipes and share boxes of produce with friends and neighbors. This morning I went into the garden to pick some wild edible greens along with some fresh raspberries for our morning smoothie. Then my hubby and I went down to the fruit trees and picked a couple of boxes of peaches and nectarines. The feeling of being able to pluck a juicy peach off of our own tree brings me such gratitude that we planted these trees years ago. I am going to make a peach cobbler tonight for company. We also picked a box of cucumbers and juiced them along with fresh ginger and lemon mint from the herb garden. I am chilling the juice to enjoy throughout the day. It feels good to have the days cool down and it is nice to welcome the rains. Since I am now freezing and dehydrating the summers harvest, I thought I would share some of my highlights of August with you. My local vegan group and I volunteered to help put on a vegan spread for our local Art Center "Sustainable" event August 2nd. A few of us shopped and prepared for 250 people a menu of veggie pinwheels, peach salsa and chips, veggie trays and dips, kale chips, chocolate mousse, vegan cheesecake, and melon and fresh fruit punches. It was so rewarding to share this fresh raw food with the art community that attended this event. It was a hit and we were asked to come back and do future events! I also launched my book, "Guide to Super Raw Foods" which is now available on Amazon and on my site in PDF format. I am working on the print version which will be available on Amazon in a week or two. You can check it out here: Guide to Super Raw Food I hope you will get a copy and that it will inspire you to bring more raw foods to your table. With over 140 pages of recipes, photos, and tips to inspire, the Guide to Super Raw Foods is now available at Amazon and on this website. It has been a busy year and I am so thankful to be sharing my work with all of you who also appreciate the benefits of raw foods. I give my dad credit for giving me the love of fresh foods and exercise and healthful living. My father passed away at the beginning of the summer and I have had the summer to remember him in his lifelong teachings of natural food as medicine and his love of harvesting the bounty from the garden. 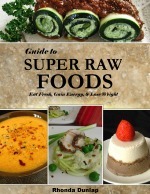 I have a new facebook page for the Guide to Super Raw Foods . Please "like" it and help me to spread the word!